Increase airflow while minimizing dust buildup in HVAC systems with IAQ 7500 HVAC sealant. The clear product provide durable, flexible and moisture resistant penetrating coatings for duct insulation in residential, commercial or industrial facilities. 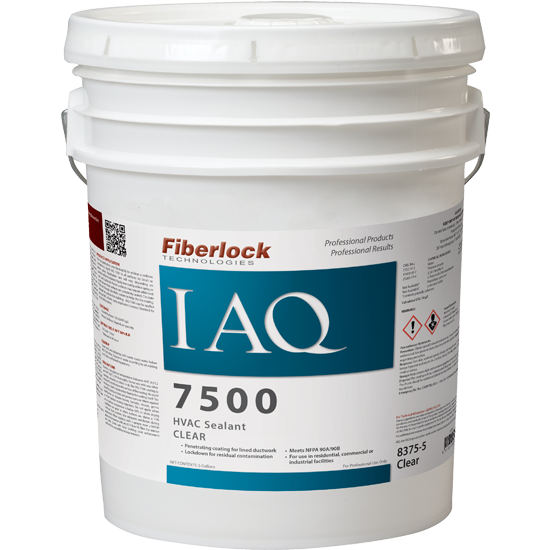 IAQ 7500 resists mold growth* on the coating surface and can be used as a post-cleaning lockdown of inanimate residual particulates, such as fiberglass, dust and dirt. Successfully tested to ASTM standard C-411 “Hot Surface Performance of a Coating on Glass Fiber Blanket Insulation”, ASTM E-84 Class A fire rated and meets requirements of NFPA 90A/90B standard.